The greatest compliment that you can give us is the referral of a family member, friend or business associate. Our referral program rewards you for your qualifying referrals, providing you with free credits to redeem on your future orders. It’s very easy to understand, and we track everything! * Sokolin Wine Perks can only be earned when referring new (and not currently existing) customers to Sokolin whose first wine order totals $250 (exclusive of shipping, misc. charges and taxes). 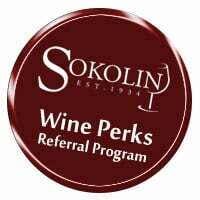 Each $50 in Sokolin Wine Perks is valid for a one time use only and cannot be used on Last Call items, Bordeaux Futures or items on sale. It cannot be combined with any other offer or used on previous purchases. Sokolin Wine Perks expire one year from the date earned. Wine Perks are not applicable to members of the same household or billing/shipping address. * Sokolin Wine Perks can only be earned when referring new (and not currently existing) customers to Sokolin whose first wine order totals $500 (exclusive of shipping, misc. charges and taxes). Each $100 in Sokolin Wine Perks is valid for a one time use only and cannot be used on Last Call items, Bordeaux Futures or items on sale. It cannot be combined with any other offer or used on previous purchases. Sokolin Wine Perks expire one year from the date earned. Wine Perks are not applicable to members of the same household or billing/shipping address. Thank you for referring your wine-loving family members, friends and business associates to Sokolin, Amreica’s Premier Fine Wine Merchant Since 1934.